Over the past couple of years I’ve spent a reasonable amount of time with Asantha Wijeyratne, CEO of SmartPayroll, a New Zealand Payroll provider. I’ve been interested to talk to him, partly because he’s a lovely guy with an interesting business ethic, but also because his business is growing rapidly, despite the fact that they’ve adopted a high touch approach which sees them (gasp) provide really high levels of service for their customers. This strategy would seem to go against the current orthodoxy which suggests that the way to scale and build profitability is to reduce costs and automate most parts of your business – it was interesting to get some statistics from Asantha about how a strategy that sees the humanization of support is paying dividends. Originally Smartpayroll used a high touch sales approach with commission staff. While this was gaining results – it was doing so at a high cost. Asantha looked at their strategy and decided to focus on providing fantastic customer service, and in doing so took a punt that the word-of-mouth effect from doing so would fill their inbound sales funnel. The result of focusing on the service has been that over a third of customers come directly from word of mouth – the ability to ease up on expensive marketing campaigns coupled with a focus on spending on customer service has seen average costs per customer plummet. This goes against what most high-growth companies are being told – that is to automate and reduce the high touch aspects of their service offering. 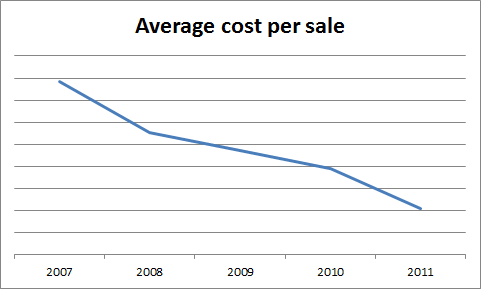 The graph below shows the move in customer acquisition costs over time, while actual figures aren’t included on the graph because of commercial sensitivity, suffice it to say the change has been significant – both in percentage and financial terms. The SmartPayroll approach sees their helpdesk having two distinct roles – customer care and indirect selling by being exceptional. Essentially therefore they’re able to achieve a double outcome from their customer support spend. The interesting thing here is the discussion around the ability (or otherwise) to scale support. Rackspace (see disclosure) for example differentiates from its competitors by promising “fanatical support”. There has been much discussion around whether support can actually scale up when you become a large organization – judging by the extremely positive feedback that Rackspace seems to get from customers, service does indeed scale, so long as the organization focuses heavily on maintaining an authentic culture. While we’ve seen lots of examples of service led organizations in other industries (Zappos is perhaps the best known example in the consumer space), software has traditionally been forgotten or put into the “too hard” basket. Case studies like that of SmartPayroll remind us that there is sometimes a better way than slashing costs. Having rolled out Smartpayroll for several clients I have to say the quality of their customer support is exceptional. Goes to show you can have great customer support and a financially viable business model at the same time.